PINATUBO VOLCANO "The Earth Shook and the Day Turned to Night"
Eight hours of ash-laden steam clouds ejection ushered one of the world’s most violent and destructive eruptions of the century, beginning at around 6 AM. This was followed by pyroclastic flows which flowed down Pinatubo’s gullies into the Maraunot and Moraza rivers. 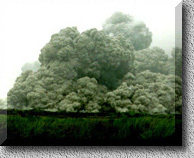 These pyroclastic flows reached some 4-5 kilometers from the center of activity. Finally, Philvolcs issued Alert Level 5 at around 3:15 in the afternoon as intermittent occurrences of small pyroclastic flows persisted the whole morning. 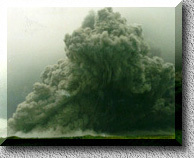 At around 8:51 on Independence Day morning, intense seismic activity was followed by three major explosions, the most powerful of which ejected a "huge, grey, mushroom-shaped cloud" that reached 20 kilometers above the vent. Ash, pumice, and other larger volcanic fragments were also ejected by Pinatubo. Major rivers and tributaries radiating from the volcano overflowed with cascading pyroclastic flows. Shortly before midnight, a second series of strong explosions hurled clouds of ash and pyroclastic materials 25 kilometers into the air. Only 24 hours after the first major explosions, another violent eruption occurred triggering heavy ashfalls that blanketed most of Zambales, Tarlac and Pampanga. Prevailing winds also blew the volcanic ash hundreds of kilometers away in all directions. 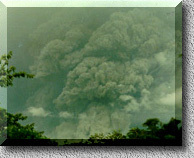 The fourth major eruption occurred at 1:09 in the afternoon of June 14, with Pinatubo ejecting another vertical ash column that reached a maximum height of 25 kilometers above the vent. This was followed by smaller, intermittent eruptions. But at 3:30 in the afternoon, a much bigger eruption produced a cauliflower-shaped column that ejected volcanic debris to a maximum height of 30 kilometers. Pyroclastic flows ran down the Maraunot River towards Sitio Ogik reaching 15 kilometers from the source. Three smaller eruptions followed at 6:53 pm; 10:18 pm; and 11:21 pm. Two explosions occurred at dawn accompanied by incandescent pyroclastic flows that moved at speeds between 70 kph to 80 kph. These were followed by seven more eruptions lasting up to midmorning, producing ash columns from 15-18 kilometers wide at the base and heights of up to 25 kilometers above sea level. This time, pyroclastic flows advanced to areas as far as 16 kilometers away from the center of activity. At 10:27 am, a violent eruption ejected a 40 kilometer high eruption column. This was followed by five similarly strong explosions from 11:17 am to 1:42 pm in such close succession that they appeared to be one continuous activity. 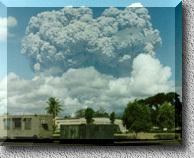 Philvolcs recorded a total of 19 eruptions that day. Eruptions that occurred after this last eruption until the next day, June 16, were not recorded. After June 16, Pinatubo’s activities declined both in frequency and magnitude where only minor eruptions were recorded.